The sixth edition of The President's Solidarity Fun Run takes place on the 23rd November and is an initiative to unify people from all walks of life as one nation in aid of the Community Chest Fund. The Valletta 2018 Foundation is supporting the 6th edition of The President’s Solidarity Fun Run which will be held on Sunday 23rd November 2014 at 10am. Launching the annual Fun Run launch, President Marie-Louise Coleiro Preca said this year’s event is different from all previous ones because it has four routes: a route for running starting at San Anton, and three routes for walking from St Joseph Home in Santa Venera, Paola Square and the University of Malta campus. The President has called for various sports teams, such as football teams, rugby teams, and basketball teams, as well as children, teenagers, adults and the elderly to join in the Fun Run which seeks to unify people from all walks of life as one nation in aid of the Community Chest Fund. Participants will be given a certificate of participation on arrival at St George’s Square. Those who wish to participate but are unable to run or walk long distances, can do so by starting their run or walk from Floriana. 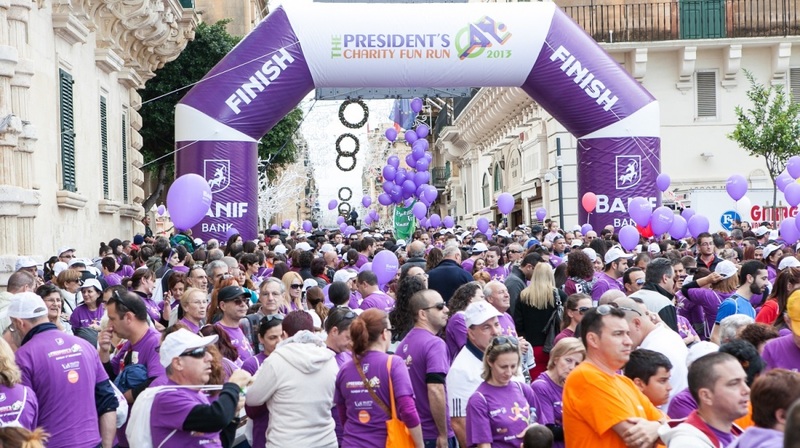 To participate, apply at any Banif Bank branch, Eurosport in Birkirkara, the President’s Palace in San Anton, the Grandmaster’s Palace in Valletta, or from the Fun Run website. Applications are at a fee of €10 which is donated to the Malta Community Chest Fund.